Brahmanic, Buddhist, and Lanna heritages endowed Chiang Mai with a plentiful array of cultural expressions. 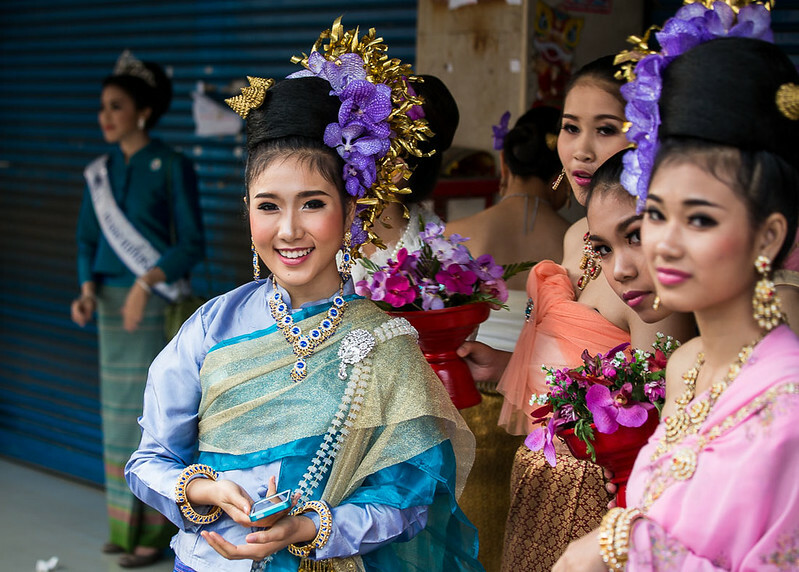 Over time (and thanks to a community with artistic aptitude), traditions evolved into festivals and celebrations that won the hearts of Thais and the interest of the world. Every year on the third weekend of January, for 3 days. Bo Sang, a village 9 km southeast of Chiang Mai. By songthaew or by bus (White Bus). You can catch either near the river by Warorot Market. The trip takes 25 minutes and should cost roughly 20 THB. 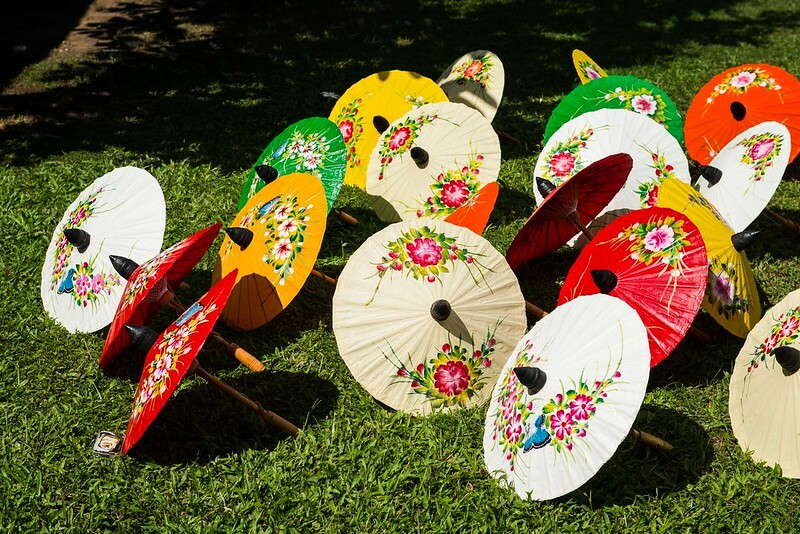 Bo Sang is home to skilled craftspeople in the making of rice paper fans, lanterns, and umbrellas. 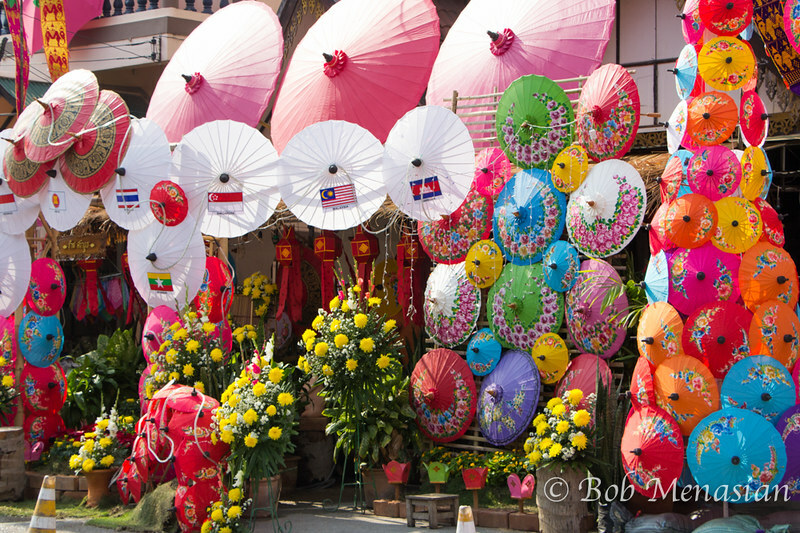 During the festival, the village streets and alleys are illuminated by lanterns, while hundreds of paper parasols decorate the outside of houses and shops. It all gets particularly magical after the sun sets, so take the time to go for a night stroll and visit the umbrella making shops. • A local beauty pageant. The key spot is Nong Buak Haad public park. The Flower Parade goes through Nawarat bridge to Thapae road, Kotchasarn Road, Changlor Road and Arak Road. 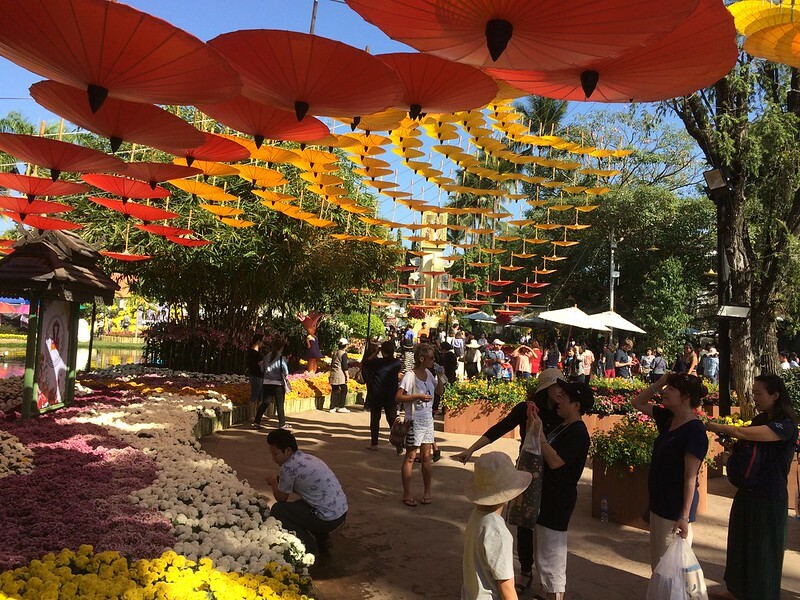 Running for over 40 years, the Chiang Mai Flower Festival is a 3-day celebration that showcases Chiang Mai’s unique flowers and plants (all in full bloom at the beginning of February). On Saturday morning (starting at 8 A.M), the long-awaited Flower Parade goes out to the streets. Floats are decorated with millions of natural flowers and accompanied by dancers in traditional costumes. The floats are considered the highlight of the event. For many months in advance, thousands of locals participate in the building of the floats, making them items of great pride to the community. As many Thais travel to Chiang Mai for the festivities, streets are not the only place that gets packed with people — so do accommodations. Make your reservations in advance! Lanna Rock Garden in Hang Dong, south of Chiang Mai. February 2, 3, and 4. You can camp there for free if you take your own tent. Jai Thep is a family-friendly festival created by a collective of artists, and defined as a “3-day celebration of art, music, and magic”. Along the enclosure of the event are 4 stages occupied by bands and DJs from Thailand and the international scene. You’ll find hundreds of art installations and a great number of creative workshops that’ll suit adults and children. April 13th, 14th and 15th 2018. All over the city center, but the key celebration spots are near the Tha Pae Gate. Marking the new solar year, the high energy ceremonies last for 3 days, and they’re the perfect time to let the child in you come out and play. 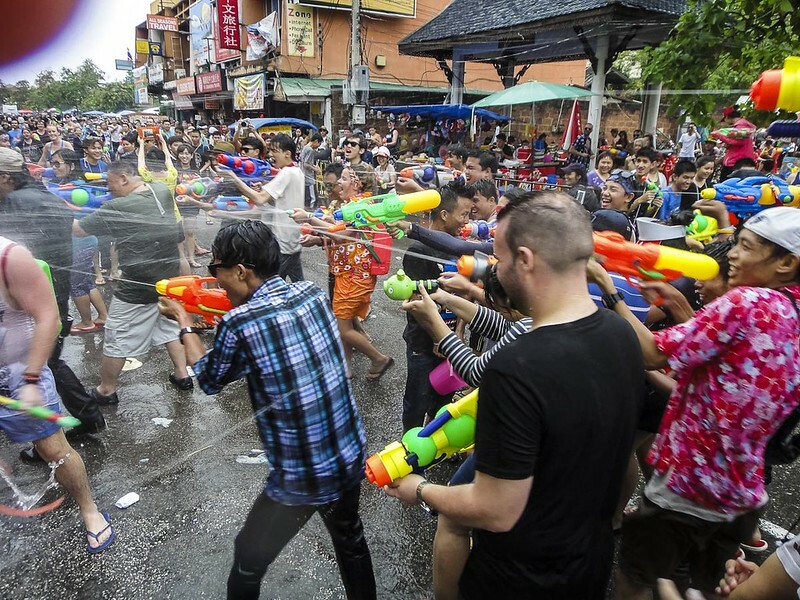 The most popular custom of Songkran is the water fights all over town. • No bikinis and no short-shorts. • Don’t through water to monks, babies, and the elderly. Being the most anticipated public holiday for Thais, expats, and backpackers, book your accommodation early. during the full moon of November, so the date is subject to change. If you write “Loy Krathong” on to Google, you’ll get the correct date for that year. For 2018 the dates are November 21, 22 and 23. Tha Pae gate, particularly between the Nawarat and Iron Bridges. 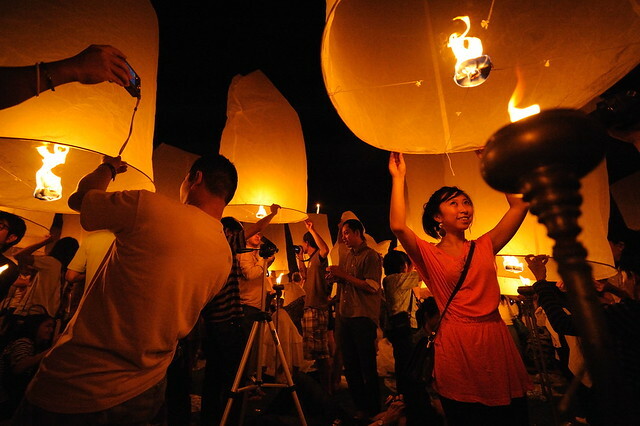 Loi Krathong or Festival of lights is celebrated for 3 days, once a year. 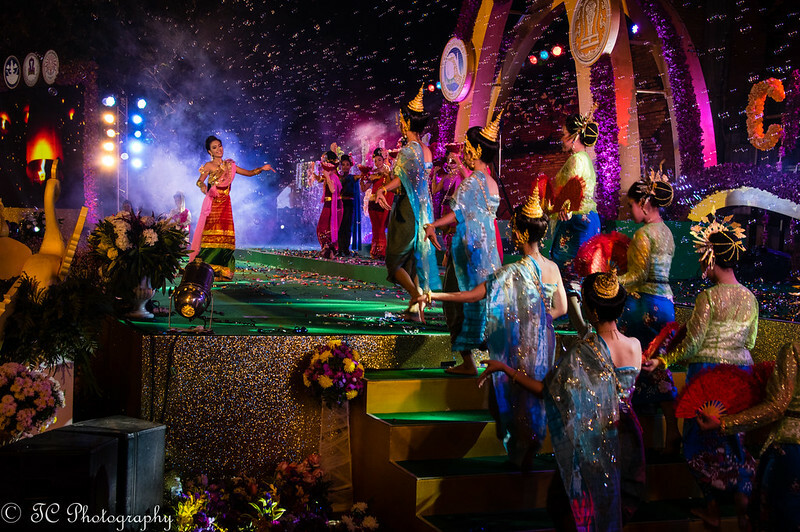 Most ceremonies take place in the evening on various venues throughout Chiang Mai. The day before Loi Krathong takes place the Yee Peng ceremony. 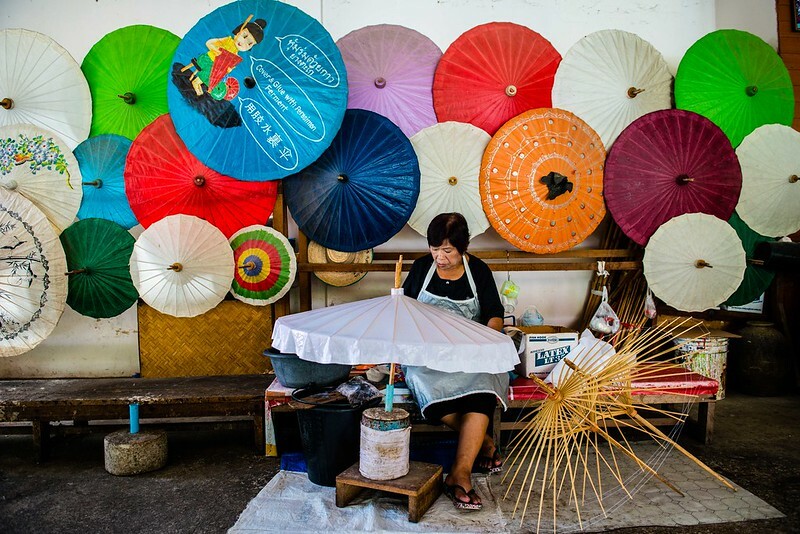 People decorate their houses, temples, and streets with paper lanterns of many shapes and colors. At night the paper lanterns are lit and tossed into the air, carrying a wish for good fortune in the new year. 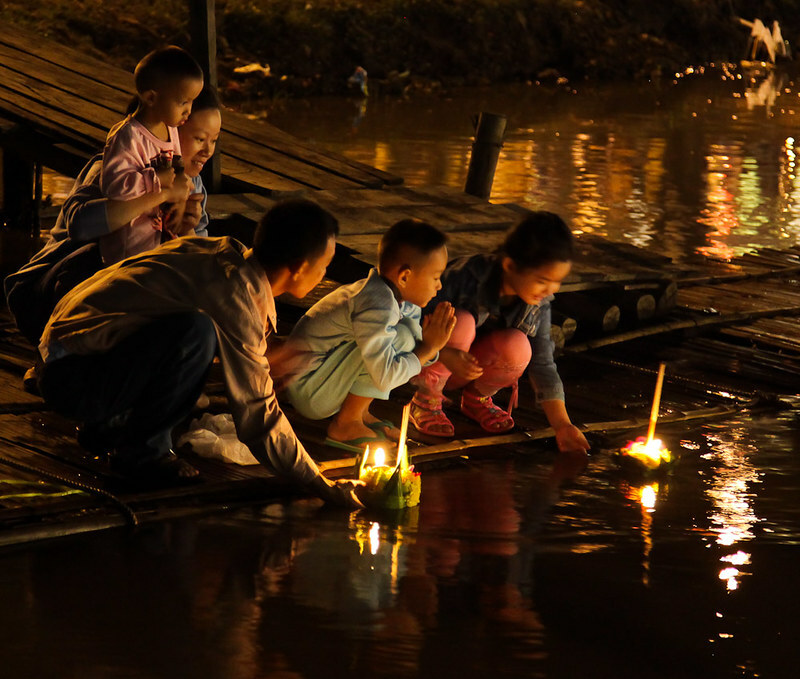 Simultaneously, on the Mae Ping river are released hundreds of krathong (baskets made of banana leaves, adorned with incense and candles), to honor the Water Spirit. The krathong symbolizes letting go of all sins and misfortunes of the previous year. 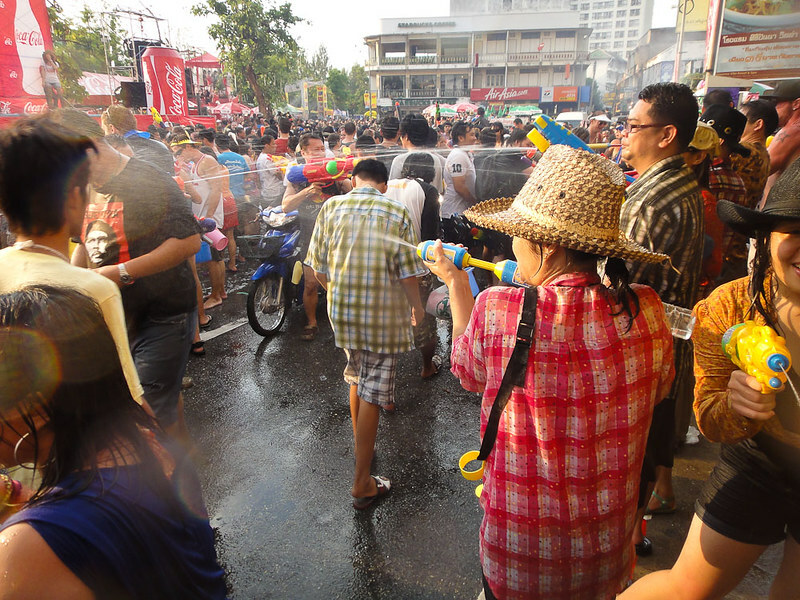 For on and off festivals and upcoming events, check the website: City Now!- Chiang Mai.